We visited the Gaslamp district on our first night in San Diego. I wanted some nightlife while keeping low key. 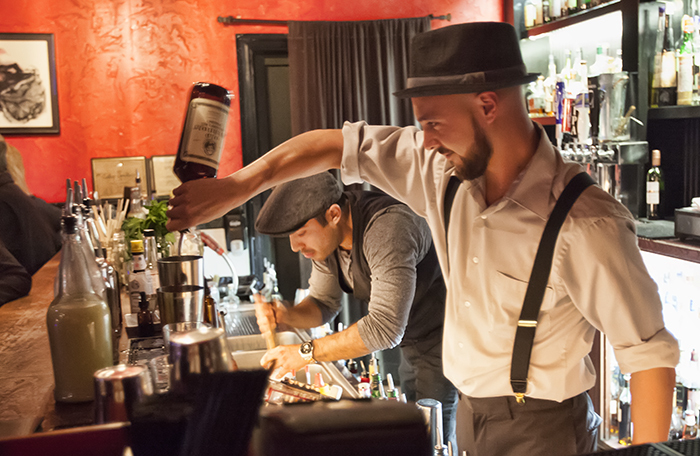 So this Gaslamp Speakeasy worked out perfectly. True to its name, it took a modicum of effort to find—hidden in plain sight, if you will. But if you call the place a speakeasy, is it? The bartenders were fantastic. Jieun ordered an Old Biddy (Blantons bourbon, muddled cucumber and mint, fresh lime, cane syrup) while my bourbon old-fashioned was off-menu (suggested by the bartender) but not exactly adventurous. In any case, both were delicious. The staff definitely know their way around the bar. All this while enjoying some great live blues music.